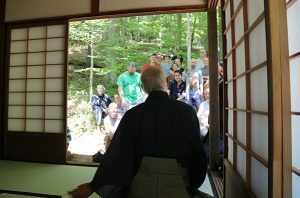 On June 17, following extensive renovations, the Monastery’s traditional tea house, Wako-an, was reopened for the summer season. The occasion was celebrated with a formal tea ceremony demonstrated by Hobai Pekarik and Anne Rubin. 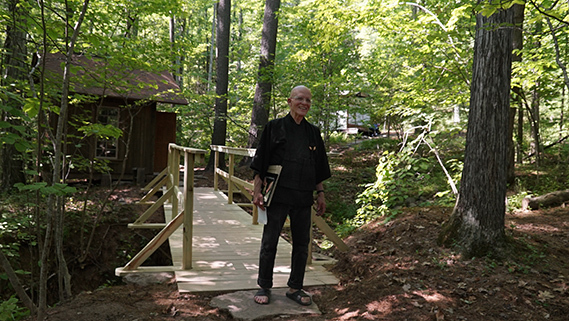 Hobai has long led workshops on chado at both the Monastery and the Zen Center, and even offers tea as part of the annual Buddha’s Enlightenment Vigil. Throughout the remainder of the summer, we’ve made good use of the tea house with Hobai training a few Monastery residents in this timeless art. Hobai prepares tea for Anne during the June 17 demonstration. 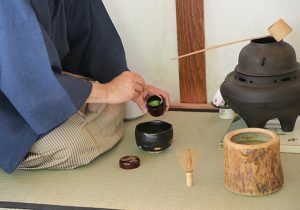 Delicately scooping out matcha from the natsume, or tea caddy. Yushin, a founder of tea practice at the Monastery in the 1980s, wrote this reflection: There is a little tea house on the west side of Doshin-ji just past the garden and bamboo grove. It was named Wako-an (Turning Towards Harmony) over a decade ago and has recently risen again to it’s original beauty. Wako-an offers a space and environment like no other. Walking over the newly reconstructed bridge to the repaired and recovered house, with its sweet smells of shoji screens and tatami flooring, it can take me back to the ancient tradition of Chado. The simple act of serving tea and receiving it with gratitude is the basis of Chado (the Way of Tea). The practice of Chado can truly spread peace and tranquility throughout. Hobai giving a talk on the Way of Tea. 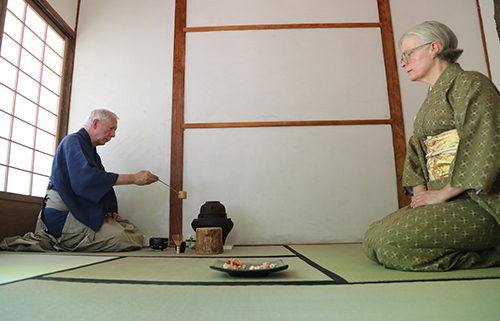 Through the summer afternoon nearly forty people came by the tea house to watch demonstrations, learn about the Chado ceremony and its history, and receive tea from our hosts. Appreciating the art of the tea bowl is one aspect of the ceremony, here Achong and Jess are taking in its unique beauty. Kimball Derrick, another founder, devotedly worked in his shop in Ohio this past year, rebuilding all the screens and purchasing new flooring which he then shipped to the Monastery. Renovations to the tea house included a new roof to replace the old leaky one, new tatami mats, and completely restored shoji screens. 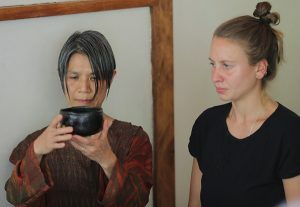 Special thanks to Kimball Derrick, Joan Yushin, Rakusan Ricci, Polly Horne, Hobai Pekarik and Anne Rubin, and all who have played a role in keeping the tea flame burning at the Monastery! Many hands were also involved in replacing the foot bridge leading to the tea garden, shown here with Mn. Rakusan, our buildings and grounds supervisor.